Drain canned veggies and combine with celery and onion in a bowl. Heat sugar and vinegar in a saucepan on the stove until sugar dissolves. Add the oil and cook briefly. While still hot, pour over veggies and stir to combine well. Cover and refrigerate overnight. Keeps up to 3 weeks, but doesn't last long because we eat it in a matter of a few days. 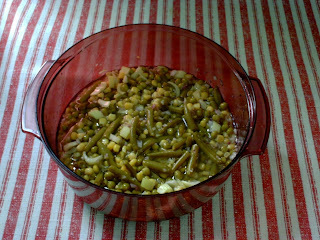 Sometimes, to add more protein, or to substitute for one of the veggies, I will add a can of garbanzo beans, black beans, or kidney beans (drained and rinsed). Yum! Yesterday was actually sunny and warm for a change. I think I heard someone say that in the last 31 days, we've had like 3 days of no rain. Which really makes for wet, mucky dirt in the garden and long flourishing wet lawns in desperate need of mowing. We usually have our garden completely in around Mother's Day week. Needless to say, that didn't happen with all the rain. Any borderline dry day(as in not actively raining) has been spent in trying to get mowing done before it gets long enough that we would need to bale it. 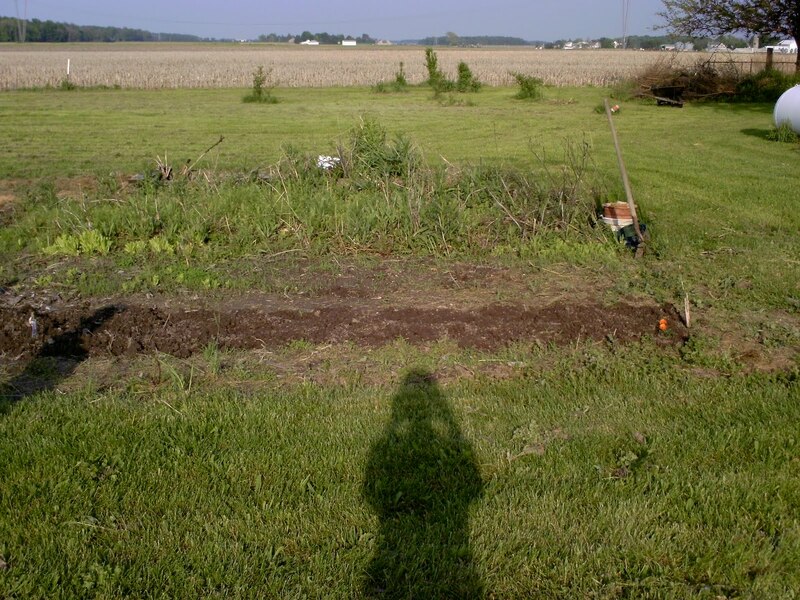 The garden has been way too wet to till, and then the tiller broke when hubby was making an experimental run through the garden and it is in the shop getting fixed (not that we can till anyway). So yesterday, as the sun was shining and my seeds were crying out to me from their little packets, I went out and in an act of desperation started turning soil over with a shovel in the dryer end of the garden. 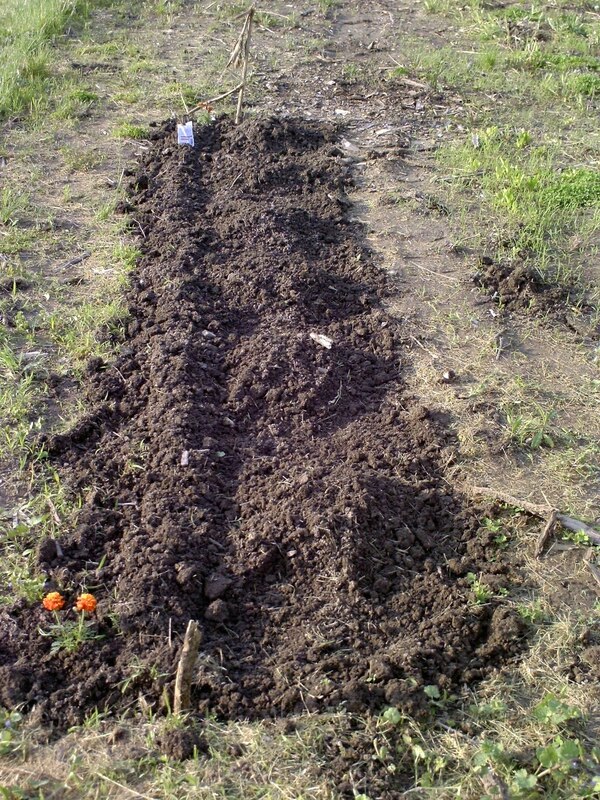 Hubby deemed it too wet to plant in, and that it would turn to hard packed soil once dried and I really shouldn't plant. But I rebelled. I had to try. Just a little. I felt like a grasshopper, rather than an ant, trying to take a nap earlier in the day. I needed to do something out there in the garden! Especially since there are 10 days of rain in the forecast! I'm dyin' here! Time will tell whether I should or shouldn't have planted, but I feel better for at least having a tiny patch of a garden in before June! 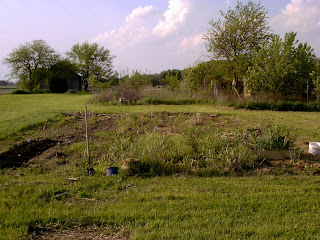 Here's the whole garden....(looks like the weeds are doing well, huh? )....my little patch is off to the left side. Morels have been the talk of the town these days. I am very new at hunting for Morels. We've known they do pop up in these parts, but we've just never been at the right place at the right time to find them. I've also been a bit tentative about hunting for them because of the fear of eating a bad mushroom. BE SURE YOU ARE 200% SURE YOUR MUSHROOMS ARE INDEED MORELS BEFORE EATING THEM! If in doubt, your county extension office should be able to tell you if what you have is for sure Morels. They must be cooked before eaten. Last night, some friends and I had a conversation about Morels. One friend, who has fond memories of her grandmother picking them and cooking them up for family, wants to pass those memories on to her children. As you may already know, Morel hunting can be a secretive art, with successful hunters keeping mum about where they hit the Morel jackpot. Well, a mutual friend of ours wasn't so secretive(perhaps she is new to this too!) and let us in on where she happened upon some, so we went looking this morning. We looked for maybe an hour and found 1 good one(pictured) and two moldy/smooshed ones. We were getting ready to leave and decided to look just one more time....and found 2 more! That was all, though. 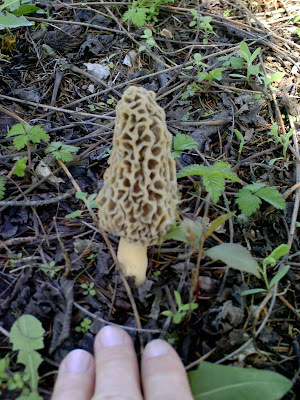 Now that I have been introduced to Morel hunting, and have at least a little better idea of what to look for and where to look, I think I need to head out into our woods and hunt for some more. One good resource for Wildcrafting that I actually have on hand and would heartily recommend is Abundantly Wild by Teresa Marrone. It has plenty of information and pictures to let you know what to look for and where. It also has recipes for each of the foods featured in the book. On the topic of Morels, Abundantly Wild gives plenty of description and ways to know you do indeed have Morels(or if you have something else). One good thing to note is that Morels should be completely hollow when cut in half. I personally am going to saute my Morel(s? hopefully) in butter. Everything's good in butter, right? 1. Go 'shrooming when the lilacs are blooming (recommendation I got from the above book). But it's not an exact science, this. 2. Wear pants/jeans, tennis shoes/boots and perhaps long sleeves. 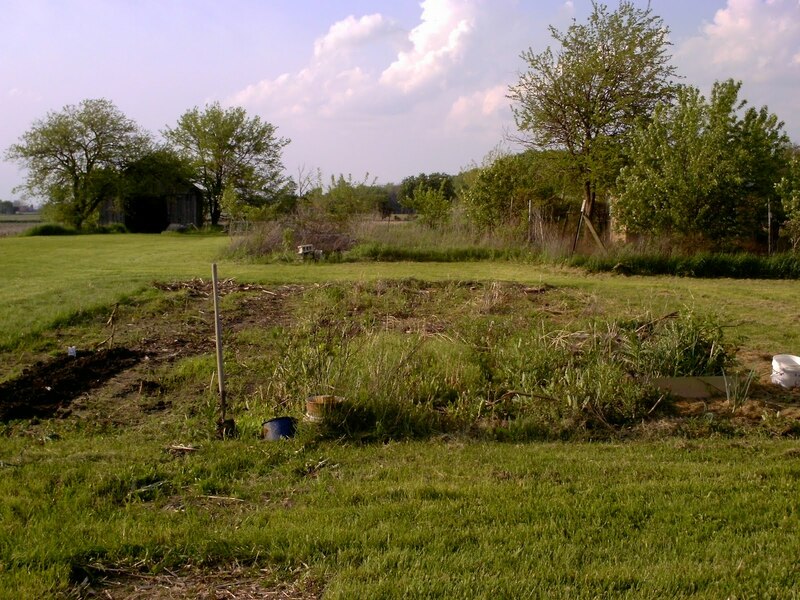 The ground will probably be wet, and you will likely be walking through the undergrowth under the trees(in our case it was wild rose bushes/rugosa rose, wild raspberry plants, young poison ivy, hedge apple trees/saplings and numerous other plants). 3.Look under and near dead trees/decaying logs and shaded areas. 4. Be careful where you step: walk slowly and keep your eyes peeled. Sometimes it helps to squat and get closer to the level of the Morels. 5. If you find one, keep looking for more nearby--they tend to grow in groups. 6. When you find your Morel(s), put them in a mesh bag. This serves the purpose of allowing for air circulation(a must--you don't want squishy mushrooms when you get home!) AND allows spores to fall out and spread through the forest as you look further. Just wanted to share a pic I took the other day as I was chopping down some bushes. 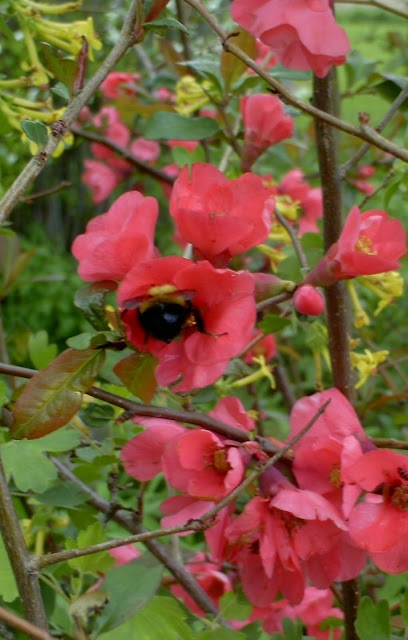 I kept this bush, and couldn't resist taking a pic of this bee having a jolly old time in the flowers! I went to the chiro today for both chiropractic and allergy. I suspected a few things and brought them in. Many of them seem fine with muscle testing, but the worst one for me was the DGL Licorice that I was taking over a month ago to hopefully aid in gut healing and was getting extremely chapped lips from. I described my eating-out experiences and requested testing for preservatives, soy, tomato and peppers. The only one that I had problems with, according to muscle testing, is SOY(again!). UGH! I don't know why this keeps creeping up on me! I also mentioned my issues (itchy throat) with fragrances(like what's in liquid soaps and dishwasher detergent, and the like--I was doing fine this morning until I washed my hands in the chiro's restroom with their scented soap and afterwards had a short stint of itchy throat). I was treated today for SOY, Licorice and Fragrances. Now, off to see what I can fix for our dinner today w/o SOY.....and not going to be doing the dishes until tomorrow, just to be safe on the fragrance side of things(as well as soy--don't know for sure what is in the dishsoap/detergent). Yep, you heard me. I fell off the wagon. I made it 8 weeks and 2 days. The "test" that was Friday made me decide to go back to eating Gluten-free on Saturday(thought I did have some chili pepper that day--but no tomatoes) and intending to be back on the wagon. I didn't take into account Mother's Day. Hubby and I were invited to go to a Chinese buffet for lunch after church, and I am fairly certain I got gluten there(though I am telling myself the lo mein noodles were buckwheat soba noodles....not made of wheat....lalalalalalala). I know for a fact I got peppers there. The Thai chicken had both jalapenos and red pepper flakes in it and the first tiny bite made my nose itch so I stopped eating that kind of chicken. I did have plenty of other foods that had peppers and maybe some tomato in the sauces. I felt fine after that meal. Full, but fine. Last night, the kids wanted to take me to Denny's with the IL's, so we went. Denny's isn't very helpful at all with making their food information easily available, but I think I probably did ok with the mushroom and swiss chopped steak, the sauteed spinach with bacon(sans the pico de gallo) and the hashbrowns. Again, I felt fine after this meal as well. I'm not having the usual token stomach/belly pains I have had in the past, but I AM rather bloated.....and not very regular, if you know what I mean. My left hand is still a bit tender, but I spent much of Saturday doing yardwork(chopping down bushes) so that may have exacerbated what I did to it earlier. Today, I am back on the Gluten-free wagon for sure. And the Tomato-free wagon. I will be watching my body when I have peppers/potatoes for adverse reactions but am going to tentatively add them in here and there(definitely not on a regular basis yet). I'm not sure I mentioned it before, but I remember now that when I had the pizza on Friday, I did have some of that "something in my throat" feeling. I don't recall having that yesterday, so I am thinking it's a tomato-reaction for me. I go in later this week for a chiro/allergy treatment. We'll see how it goes/what I find out! It's springtime, the time when pollen counts start to go up. My BioAllergenix treatments have helped substantially. I am no longer taking daily antihistamines to survive the Spring/Summer/Fall seasons(not that they ever really helped anyway), but I still have here-and-there episodes of hayfever. For example, yesterday I was mowing our grass for nearly 2 hours and by the time I got to the end, I was sneezing and blowing my nose a lot. Enter the Neti Pot. Or a similar product I actually prefer: the Neilmed Rinse Bottle . Both the Neti Pot and the Neilmed Rinse Bottle work on the same premise: run warm salt water through your sinuses to rinse out all of the stuff your body is reacting to. This is a simple, cheap, effective means of finding relief, not only for hayfever/environmental allergies, but also for when you are fighting sinus problems/cold symptoms. It flushes out bacteria the same way it does the pollens. It's also particularly entertaining for kids to watch. My daughter was mesmerized by it yesterday. (Hee-hee) Cheap entertainment, lol. And it makes you feel better, too! When I was finished mowing the grass yesterday, I made sure to use this, and my condition greatly improved after I did. Note: If you have completely blocked sinuses, it might not work well. But if you are having lots of hayfever reactions/runny nose issues and can breathe through your nose at least a little, it will most likely work and help get rid of the stuff your body is reacting to. If you have an ear infection, it might be a good idea to treat that first before using a sinus rinse aid. 1. Fill with very warm tap water. My water is softened. If you have hard water, you may want to use warmed distilled water. 2. Add 1/4 teaspoon of Canning Salt or Sea Salt, put your finger over the hole and shake to mix. You don't want any additives in your salt (don't use iodized salt!). (If you prefer, you can buy little packets instead of using your own salt). 3. Over a sink, with your head slightly tilted, place the bottle tip at the highest nostril and gently squeeze the water into your nose. Breathe through your mouth and relax. If the water is too warm, let the bottle sit for a bit. If it's too cold, you can start over with warmer water or microwave it in 5 second increments until it's the right temp for you. If the water is coming into your mouth, sometimes it helps to pretend you are about to say a word starting with hard sound of the letter "k". 4. Once the bottle is half-empty, stop squeezing the bottle and let your nose drain into the sink. Place a finger on your highest nostril and press as you gently blow the excess water out of the opposite nostril. 5. Repeat for the other side. Rinse your face with fresh water. Dry. Then use a tissue and gently blow your nose to get any residual water out. This can be repeated throughout the day. I believe the recommendations are for morning and evening, and after you are exposed to your allergens. This week, circumstances made me go out of my food comfort zone (read: home) and eat - gasp - Fast Food. I went to Arby's on Wednesday with much trepidation. I was tempted to totally go off the GF/NF eating regime and get whatever my little heart desired. Instead, I analyzed the menu as I waited to order my food. I don't have a handy dandy electronic device to look up the menus and ask friends online what to get at Arby's and didn't want to hold up the line asking tons of questions. So I went with my gut (hehe). Turns out I did great at Arby's with the Gluten-free choice. They have an Adobe pdf of Menu Items Without Gluten on their site. I got the Chopped Farmhouse Salad with roasted turkey and Buttermilk Ranch Dressing, and a bottled water. I picked the tomatoes off of the salad. It was good, but not very filling for me. I had to eat something more when I got home. I did have some gut pain/burning later on that day, but it only lasted a day (where before it would have lasted about 3 days). I attributed the pain/burning to trace gluten contamination or maybe I got a stray tomato in my salad, or the juice from the tomatoes was enough to bother me. On Friday, I ended up having two slices of Little Caesar's Hot and Ready Pepperoni Pizza and a couple pieces of cheesy bread. Around an hour or so after eating, I started having a slight "tomato" response (itchy nose, some itchy throat, and itchy bum...and some slight gut burning action). I did wake a few times with an itchy throat. But it's gone this morning. And I did mow the lawn yesterday (was sneezing/runny nose by the end of that hour and a half or so of mowing) and didn't take a shower afterwards so that might have been a trigger as well. The jury is still out on whether the gluten is effecting me....I am a little...er...backed up, which was my general MO when I was on grains. So maybe that should tell me something, huh? Looking back, I would be willing to bet that my reaction to the Arby's meal was probably to preservatives/additives in the dressing. The first ingredient is (probably GMO) Soybean oil, and it also has MSG, Xanthan gum, Natural Flavor, Potassium Sorbate and Sodium Benzoate(Preservatives), Polysorbate 60, Phosphoric Acid, and Calcium Disodium EDTA(to protect flavor). Take your pick, all or one of those things might have been my trigger. None of the other dressing options would have been any better. There was also soy in the turkey meat. BUT...I did mow with the push mower a lot yesterday, so that could have stressed/injured my hand as well....just trying to keep everything in perspective...it's not all necessarily doom and gloom. I am back on the GF/NF(at the very least, tomatoes) diet as of this morning. My response to the tomatoes has lessened substantially, but it's definitely still there. I think it is doing my body good to avoid these things.